This building still exists but was completely gutted and cleverly reskinned in the 80s and is now unrecognizable. 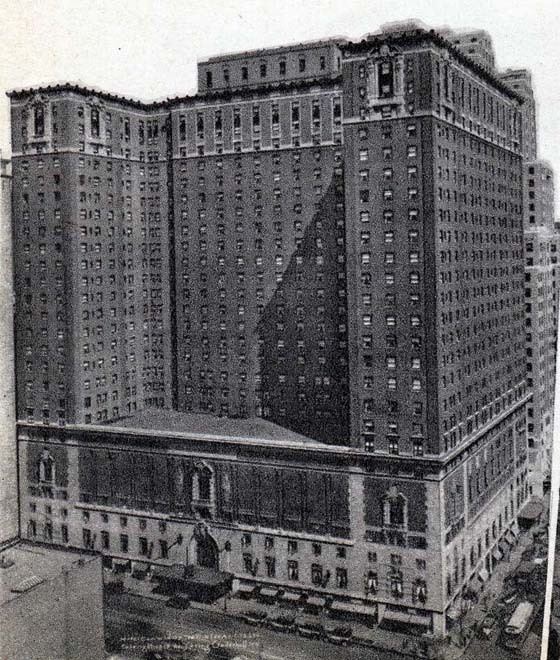 Similar to the Pennsylvania Hotel, it was built to service the adjacent large railway station (Grand Central). Steel frame, masonry cladding. 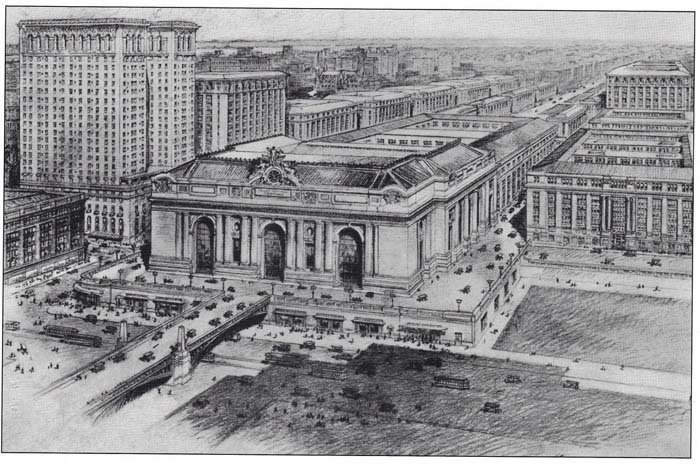 Above- location shown in relation to Grand Central. The Commodore Hotel was constructed by The Bowman-Biltmore Hotels group. 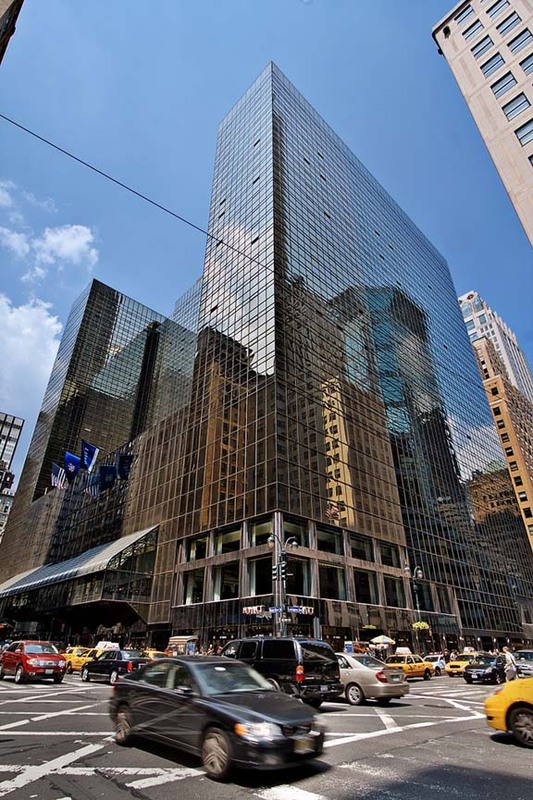 The structure itself was developed as part of Terminal City, a complex of palatial hotels and offices connected to Grand Central Terminal and all owned by The New York State Realty and Terminal Company a division of The New York Central Railroad. The Commodore was named after "Commodore" Cornelius Vanderbilt, the founder of The New York Central Railroad System, whose Statue adorns The Grand Central Driveway next door to the hotel to this day. 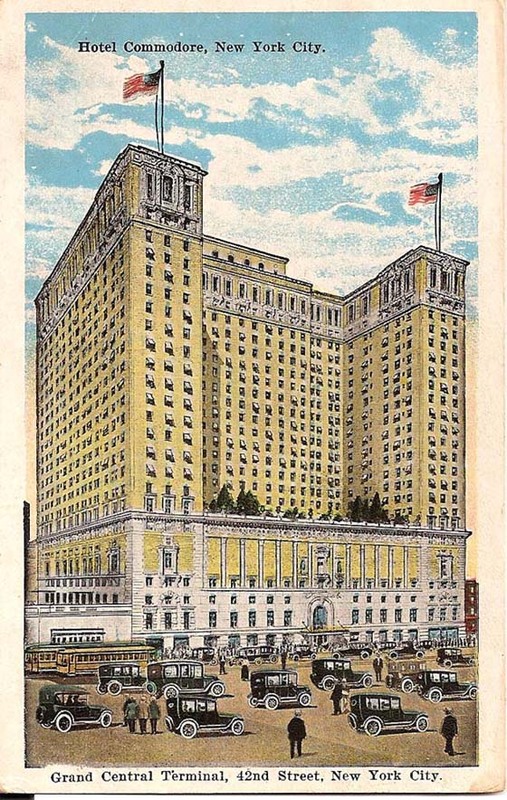 The Commodore was designed by Warren & Wetmore and leased by The New York State Realty and Terminal Company to The Bowman-Biltmore Hotels Corporation of which John McEntee Bowman was President. The Commodore opened its doors on January 28, 1919. Bowman-Biltmore's own Herbert R. Stone oversaw the decor of its 2000 rooms. The "Most Beautiful Lobby in The World" as it was known was also the single largest room of the day with modern low ceilings and a waterfall designed by John B. Smeraldi. A group of conventioneers once told Bowman that "New York City was like a circus", so the next day Bowman, ever a showman, arranged to place a circus, complete with elephants, in the grand ballroom. Another popular spot was the Century Room, which boasted its own orchestra. The Commodore shared a parking garage with its sister hotel The New York Biltmore Hotel, Bowman-Biltmore's first hotel investment. Another Terminal City property one block from both The Biltmore and The Commodore is The Roosevelt Hotel, a United Hotel asset which merged with Bowman-Biltmore Corporation on March 4, 1929 which gave them access to all railroad passenger traffic in and out of New York City. 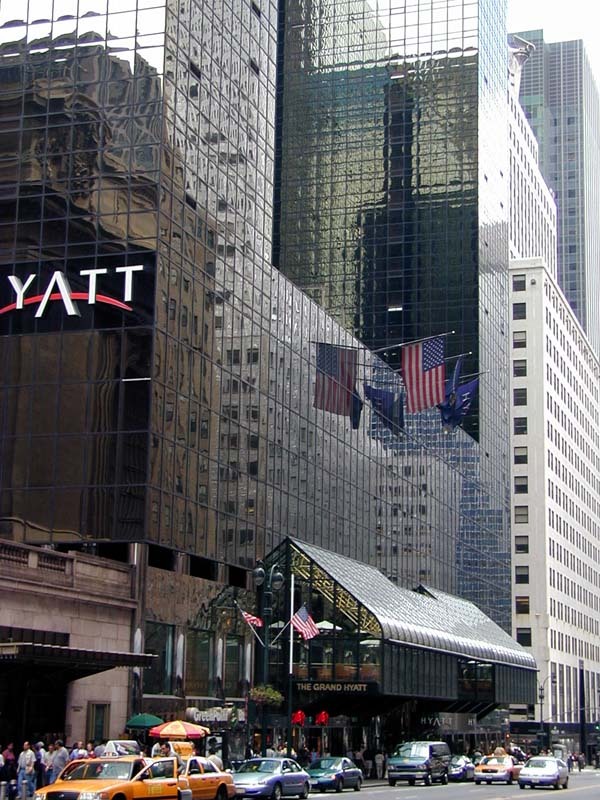 The Commodore was successful for decades and in June 1967 The New York Central Railroad, which by then was running the hotel through a division called Realty Hotels, upgraded The Commodore with a 3.4 million-dollar refurbishment. On May 10, 1972, while John R. Garside was the hotel's General Manager, The Commodore became the first hotel in New York City to show in-room movies through Player Cinema Systems. 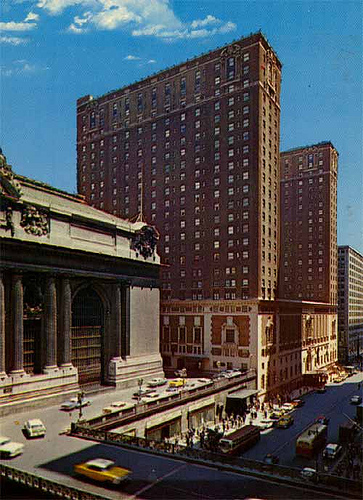 By the late 1970s, both the railroad line, now called The Penn Central Transportation Company, and the hotel itself, had become less successful. On May 11, 1977, the bankrupt railroad's asset manager Victor Palmieri told the city that the Commodore had lost $1.5 million in 1976 and might have to be shuttered. At that point, the Trump Organization bought The Commodore.